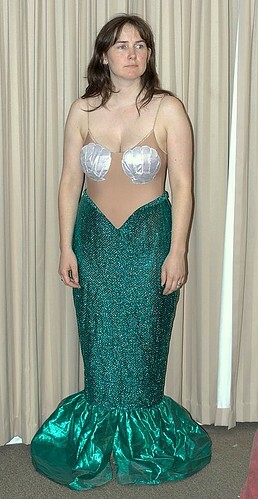 I have been trying without much success to find a picture of my mermaid costume that I made and wore to a nautical themed party in 2000. Out of frustration I dug it out and bravely tried it on – I have had two children since then, and gained a few kilos before that after all – and was pleasantly surprised to find that it actually still fits ok. Well, just. Anyway, here is the result of our photoshoot. The design was inspired by Ariel, from one of my favorite Disney movies, The Little Mermaid. I used a flesh toned body suit as the base, with sequined knit fabric for the tail. I put a split in the back so I could move (very important at a party) and made a “fin” frill for the bottom to hide my feet. The shells were a little more challenging. I drew a rough pattern of a clam shell, but with the finger bits spread out so they could be shaped. I cut out four shells in a white sparkly/pearly Lycra fabric (scrap from another project) and two from thin purple card to go in between for body and to give a slightly purple tinge. Obviously I wasn’t thinking about cleaning it at the time! The pieces then got zigzagged together around the edges and shaped and stitched onto me. This was the really tricky part. I had the body suit on, standing in front of the mirror and tried to pin the shells on but this proved to be far too dangerous, so instead I got some thread and a needle and hand basted each of the clam fingers to the suit, all nicely overlapped and in the correct position. Then it was just a matter of stitching it all around. For those who are wondering, yes it was a great party!